Once blogless, now just stuck with the name. 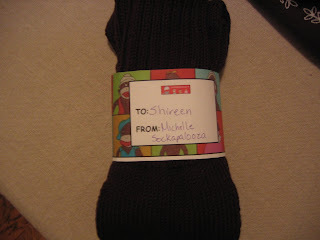 My sockpal is a much better person than me. Not only does she give me beautiful more-than-knee high socks, but also two skeins of incredible sock yarn AND perfectly crafted stitch holders. Thank you Michelle - it is all truly wonderful!! Look how high they go! I hope she wasn't cursing me as she knit higher and higher . 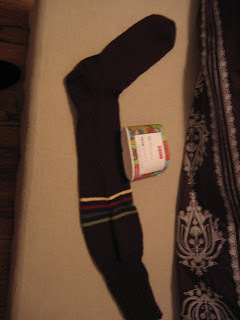 . .
That is one looooong sock. 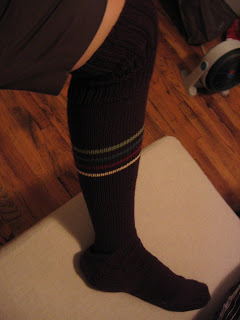 Pattern: Canyon Hiking Socks from "Greetings from the Knit Cafe"
I can attest to how comfortable they are! 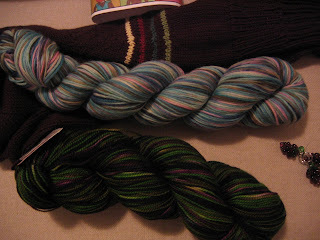 And what gorgeous sock yarn - my feet will be happy for years! I've decided that these are boysenberries. Why not?? Those are some sweet socks. 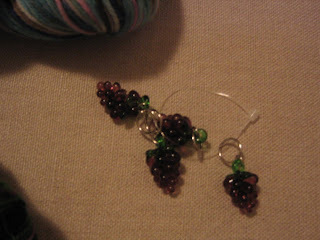 And the stitch markers? Would totally convert them to earrings. Very nice! I also like the ones you made! Great work! The Last Baby Blanket I'll Ever Make?